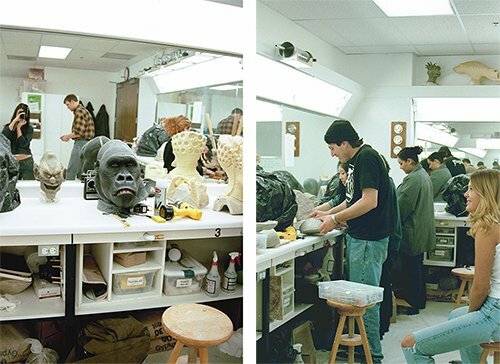 When we established Make-up Designory (MUD) in 1997, we shared a desire to create a place for higher learning in the field of make-up education. We wanted to create a place that supported the needs of the makeup industry. We also wanted to put our students first. MUD began in a two-classroom, 800 square-foot location in Toluca Lake, California. We started out offering courses in beauty make-up, character make-up and special make-up effects. After 3 years, we moved to cozy downtown Burbank and opened up a 5-classroom school complete with administrative offices, student store and photography studio. Today the school and store are still located in the same place, but we have moved the administrative offices next door to make room for 3 additional classrooms, a library and student lounge. We still offer courses in beauty, character and special make-up effects, and have added courses in hairstyling, airbrushing, portfolio development, some for non-professionals too! We also have a 10,000 square foot warehouse and distribution center in Valencia, CA that also houses our Corporate Headquarters. Not only did we expand locally, we expanded nationally. In 2005 we opened our East Coast branch in New York City. Our 4 classroom, office, and store loft space on a second floor in SoHo eventually grew to be 6 classrooms, separate offices plus a ground-level access retail space. 9 years later, we were again in need of even more space so we moved the school to the Financial District. Our current location occupies the entire 15th floor of the historic, 21- story American Express building and offers 9, classrooms, administrative offices, and a student store. And there’s more still to come! MUD is constantly expanding its reach with partner schools and MUD STUDIO locations from Asia to Europe and San Diego, CA to Giant Springs, MT. We are bringing our vision of excellence in make-up education to the world! Have we come a long way since Toluca Lake? Sure. Yet our founding philosophy still guides everything we do.